Continuity mistake: When Shake, Frylock, and Meat Wad return from Memphis, they notice the door of their house has been ripped out and knocked onto the yard (Meat Wad even makes a comment about it). But as they walk inside to Mothmonsterman, the door is back on the hinges were it should be. 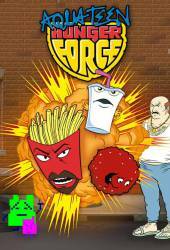 Continuity mistake: In some episodes, the Shake-shaped door for Shake, Frylock, and Meatwad's house opens outwards. In others, it opens inwards. Carl: If you need anything, you know who to look to. Someone else.